If you're obsessed with gear, nothing can be more fun than hearing what actual professionals use in the field. Well thank goodness for PBS! They went ahead and took a survey of working documentarians—asking them about what cameras, lenses, tripods, and other equipment they use. The results are telling. It's not exactly clear whom those who participated in the survey actually are. PBS only specifies that the 147 respondents are "working filmmakers" describing themselves as directors, editors, producers, and cinematographers. A number of things stand out. First off, DSLRs still make up a huge portion of the cameras being used, with the 5D Mark III leading the pack. 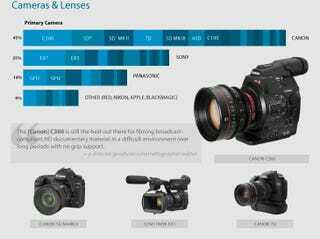 However, the one camera picked more than any other is a full-fledged video camera, the Canon C300. It's pretty impressive how much the C300 has resonated with doc makers having just debuted in 2012. Canon not only takes the gold in cameras, but lenses as well. Filmmakers surveyed use Canon glass over any other manufacturer by a HUGE margin. The most popular prime lens is the 50mm f/1.8, and the most popular zoom lens is the 70-200 f/2.8 L.
Fairly evident is that the gear pros use is a lot of the gear you may use too! There is nothing extravagantly expensive here. It goes to show that the distinction between pro and amateur is shrinking, at least when it comes to technology.